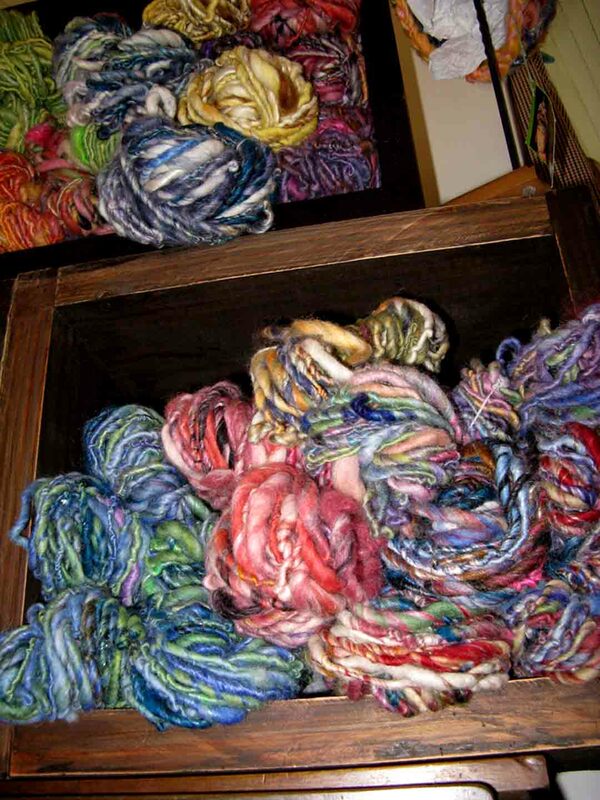 Station 8 Antiques: Magnolia Handspun has arrived! I am thrilled to introduce Magnolia Handspun, the new line of hand dyed, hand spun yarn I'm now carrying at Station 8! The artist, Camilla Emond, creates this colorful & very textured yarn by hand dyeing and then hand spinning fibers into original wool yarn. And she makes it right here in the Flathead Valley. She intertwines wool, alpaca, angora locks, Angelina, cotton and silk into soft, luxurious yarn that as she says" makes you happy to knit"! The feel of her yarn is exceptionally soft. Each skein is unique and cannot be reproduced, thus giving you an original, one of a kind piece. Just yesterday, Camilla brought in a new color into Station 8, called Lotus Blossom,which is as beautiful as her other selections. She names them yummy names, such as Buttered Rum, Merlot, PrimRose, Spring Iris, Pommegranate, and Citrus. The names alone are scrumptious and describe the blending of colors that make eash skein delicious and desirable! For more background on Camilla, check out the feature story recently published in the "Artful Blogging Magazine". I am so proud of her accomplishments. Come into my shop next time you're headed to Columbia Falls, and enjoy the rich feel of her luxurious skeins. You'll start dreaming of your next knitting project to give yourself or a friend! Thank you so much Collette! Well, I guess we are and running. I love these colors, knitting is one of the things I will learn when I move to Montana. Check out my blog and see what I did for the first time! We are having so much fun. I'll be in at Christmas.